Next week I will have a review up on a book to help children process death and the Orthodox services surrounding it. When My Baba Died was written by an Orthodox woman who is also a mortician and certified funeral celebrant who struggled to guide her own children through the death of her grandmother. I wanted to make sure that I had a chance to go through the book with my own children and see their response to it but I really like it so far. More about that next week. In the meantime, I am thinking about such things because it is coming up on the second anniversary of my father's death. My father had a genetic blood clotting condition, which I inherited. It is the sort of thing that is not always a problem but decided to randomly rear its ugly head. It is a capricious little condition. Because of this when he developed cancer, it was not discovered immediately. The blood clots in his lungs just appeared to the kind that we are more susceptible to developing. But after a few months of developing more and more clots despite being on thinners, they discovered he had non-smoker's lung cancer. We children and he himself were almost grateful that it was cancer because we no longer had to worry so much about ourselves. I was pregnant at the time and my oncologist (because they are blood specialists not because I had cancer) was flipping out about keeping my blood very thin and doing constant checks. The day that my youngest daughter had her ten day well baby check up, my father discovered he had cancer. He did not want to tell me right away and I practically had to pry it out. But I knew. I could feel when I heard his voice. I just wanted to know that I was right. I knew I was, but I needed to hear it. That said, while I miss my father a great deal, I have tremendous hope in God so I am not too sad at this anniversary. We plan to talk about the good times and the funny events like the time he tried to trick my Tita Rosa (my dear aunt Rose) in to eating a Gaines Burger. When my grandfather found out, he made my father eat it and more. There is a lot of good to remember and we have to keep it at the surface so that we don't only see the bad memories. I realized that in our family, we like to tell stories. I think we get that from my mother's side. My mother is Cherokee. Legit. Like Indian basketball league, legit. They tell stories. They sit around and tell children stories that go backwards. They start with stories about when the child was a baby, and the when the parents were babies, and the back and and back and ever deeper. Some of the best times of my entire adult life were when my mother's parents stayed with us while my grandmother recovered from surgery for an infection in her bones. She needed to stay close the hospital and be cared for and I did it gratefully. At night while everyone else slept, my grandfather told stories I had never heard before. My husband and I and even my oldest son sat in rapt attention, barely breathing and certainly never interrupting. Those nights were golden. Anyway, my father's birthday was around Western Easter. He had this thing for Peeps. You know, the nasty little marshmallow things? He loved them. It is so weird and so not like him. My father was a foodie and a healthy freak. He was doing spirulina and chia cleanses before it was cool. They were his dirty secret and not many people knew. That and Slim Jims, which I have NEVER tried out of the fear that I have a genetic weakness for them, God forbid. 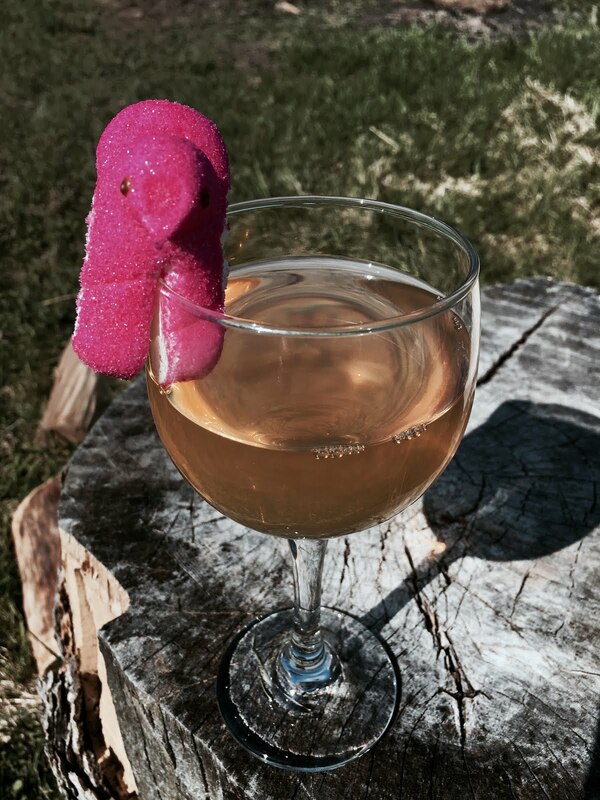 My father would have one Slim Jim a year and then he would have a package of Peeps with cheap white wine, because how better to cut the cloying sweetness than with the aggressive acidity of flowery smelling Chardonnay? This was his birthday treat, eaten in secret. As he was dying, I gave him a case of Peeps and Slim Jims. Why not eat them now? He didn't finish them all and they were thrown away after he died but they were there when he needed them. This Pascha, I started a new tradition. I want to keep the stories alive. 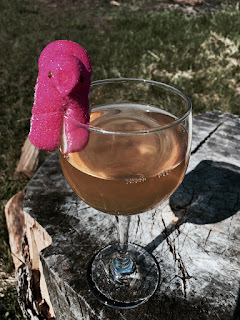 I had a pretty pink peep and a glass of wine. It was good even though it wasn't really. I told the kids about my father's birthday treat. Every year I am going to do this and I am going to tell this story. This is how one's memory is eternal. That is really what it means. Memory eternal, Daddy. I just found your blog and I am smitten. I want to read every post on your old blog. I have wondered sometimes if I am crazy, trying to do what I do, and if I am going to crash and burn. Now I know I'm not alone, there are other women living lives like mine in today's world and if they can do it, I can too. Thank you for being online and sharing what you have. I appreciate it so much. If you're curious, I have six children, my oldest is seven. I homeschool, we are building a homestead/farm, I'm going to be milking a cow soon, I cook everything we eat, I sew some of the things we wear. It is not easy and it looks so weird to "normal" people. I'm totally committed but sometimes a little discouraged. We tried really hard to move to the UP a few years ago after falling in love on a vacation to Marquette. God did not let it happen so I strive for contentment here in Indiana. I have never felt such a sense of home, of belonging and wanting to stay forever, anywhere I have been until I came to the UP. Maybe someday...and in the meantime, vacations when the cow is dry? It is a very sad story and it reflects the image of the author. She really had a sad story as well and that she tried to explain in her book.